MICUA member institutions serve 64,000 students every year. The student population is economically diverse, racially diverse, and demographically diverse in other ways, including adult learners and non-traditional students, students who speak English as a second language, students who are first to go to college in their families, and transfer students from community colleges. Based on 2017 IPEDS enrollment data, 37 percent of undergraduate students enrolled at MICUA member institutions are students of color. The fastest growing population at MICUA institutions is Hispanic students. 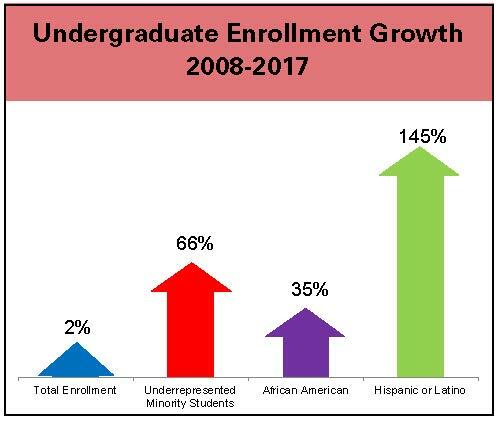 Between 2008 and 2017, Hispanic undergraduate student enrollment increased by 145%, while African American undergraduate student enrollment grew by 35%. In comparison, total undergraduate student enrollment grew by 2% at MICUA institutions. Based on IPEDS graduation rates, half of the MICUA State-aided colleges and universities have eliminated the graduation gap between students of color and the general student population. The Maryland General Assembly passed legislation in 2008 that requires each independent institution that receives State Sellinger funds to report annually to MICUA on programs and practices that promote and enhance cultural diversity. As defined in statute, “cultural diversity” means the inclusion of those racial and ethnic groups that traditionally have been underrepresented in higher education. For the past 11 years, MICUA has surveyed Maryland’s independent colleges and universities to identify new and on-going programs and activities that promote cultural understanding, build on impactful policies, and create a blueprint for success in creating inclusive campus communities. With information collected from these surveys, MICUA publishes an annual Cultural Diversity Report. The Report does not list every initiative or effort on each campus, but provides a general overview of common activities, unique programs, and best practices to enhance the campus climate and support cultural competency. Many of the examples provided in the Report are ongoing, multi-year practices and programs that have proven effective. Other examples reflect new initiatives and emerging trends. The Report also highlights meetings, lectures, discussions, ad hoc events, and other activities held to promote learning about and continued discussions of race, gender, and equity. To view a sampling of programs at Maryland’s independent colleges and universities created to promote and enhance cultural diversity—as highlighted in the annual MICUA Cultural Diversity Report— click here.